The army of high-speed broadband phones is actively seeking new recruits to join its rapidly-growing force, and the LG Revolution is the latest to graduate from boot camp. 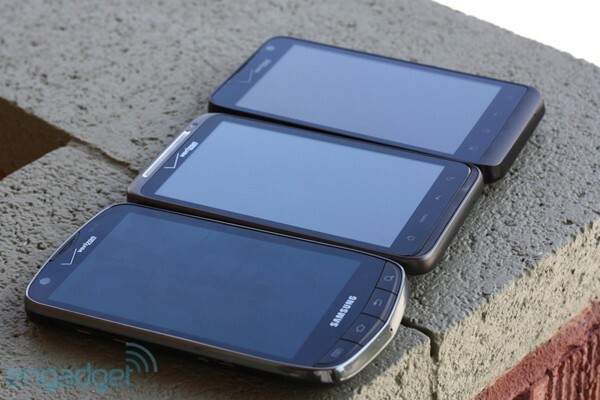 We've witnessed the emergence of three Verizon LTE handsets in as many months, beginning with the HTC Thunderbolt and the Samsung Droid Charge a few weeks later. As if this wasn't enough choice to tempt your tastebuds already, the LG Revolution -- the entertaining climax to the classic 4G trilogy -- was born one full moon after that. With three options, all so close to each other in dimension and features, it's natural to compare all of 'em and make the call on which one is the best of the bunch. 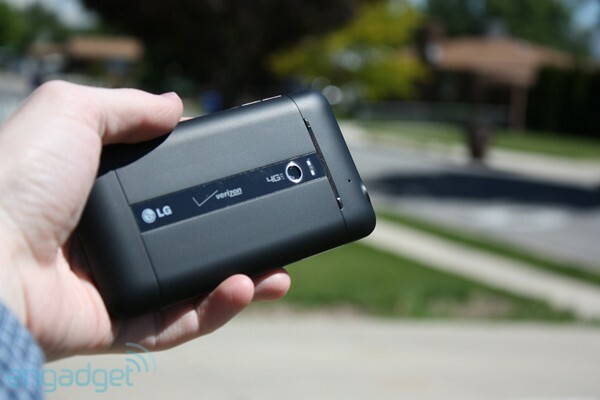 Is LG's first crack at Verizon's LTE network truly a game-changer, as its name suggests? Or does this Revolution fail to even get its feet off the ground? Read on after the break to find out. A decent phone that, aside from its inclusion of LTE, doesn't live up to expectations -- or price. How would you rate the Revolution? When first looking at the Revolution's box, we experienced a serious bout of déjà vu because it's almost completely identical to that of the Thunderbolt. Exerting the same amount of elegance as its predecessor, the box comes in a minimalistic black sleeve, the logos and words etched very carefully on top. Only the back of the sleeve has anything written on it, which is the normal regulatory certification information. When we didn't look close enough it appeared as if nothing was even there; put in the right light, though, the names and imagery seemed to pop out at us. Taking the box out of its sleeve, we noticed the same dark theme going on, but when lifting the lid and peering inside, a bright red that matches Verizon's standard livery offered a stark contrast. When we dug deep past the square bed in which the phone laid, we found the usual wall plug-in with USB port and separate micro-USB cord, obligatory user guides and warranty information... and that's it. No headphones or micro-HDMI cables can be found anywhere. We believe that Verizon, much like with the Thunderbolt, assumes that since you're purchasing a phone for $250 on contract, you'll either have the money to spend on a decent set of cables and headgear, or you already have some sitting around in a storage bin somewhere. At first sight, the Revolution doesn't appear to be a very attractive phone. Don't get us wrong -- it's not ugly, it's just plain and colorless. It's a beast, every bit as large (if not larger in some dimensions) as its LTE brethren, and more boxy on the sides. If variety is what you're looking for, you're not going to find it here. The phone seems to emulate its packaging perfectly, blanketed in a soft black tone that's only interrupted by a chrome strip on the left and right sides and a long piece of glass on the back. That's just not enough for the phone to keep from blending in with dark surfaces. While we don't want to be on the other side of the spectrum and getting distracted with every color of the rainbow, the Revolution is just not as aesthetically pleasing as the Thunderbolt and Droid Charge. It's not all rainstorms and pouty faces when it comes to the Revolution's design, however. There's a minimalistic theme with this device that we've grown to appreciate; it's not a busy-looking phone at all. Its back and curved corners are the most visually appealing features; the corners are curved with just the right touch of softness, and the back looks like a bulging bubble with steeply tapered edges on the left and right sides. With a 4.3-inch screen and absolutely massive frame, we were amazed by its heft. Large as the device is, though, it can't even be considered the ultimate champion in the genre. It's taller and wider than the Thunderbolt, but shorter and skinnier than the Droid Charge; it matches the former's thickness at .52-inches (13.2mm) across the board, with no protrusions (such as cameras) popping out of the back. It still sits quite heavy and bulky in our palms -- our average-sized hands can hold it well enough, but smaller mitts may have more of a struggle with its depth and breadth. Fortunately, the phone isn't slippery, thanks to a soft-touch plastic surrounding the entire back. It's not the most portly LTE handset on the market, but it comes awfully close as the 6.08oz (172g) Revolution is only .15oz (4g) lighter than its HTC cohort. With that said, the device's mass and build leaves no doubt in our mind that it's a solid chassis that should easily withstand normal wear and tear, and certainly gives more of a feeling of durability than the Droid Charge before it. We were delighted to find a micro-HDMI port for video out proudly displayed on the right side of the Revolution. This port inspires either love or apathy, depending on how you feel about it. We enjoy the additional functionality the micro-HDMI brings -- besides, if we're shelling out the big bucks for a phone and it doesn't screw with the design, it should be thrown in. Immediately neighboring this port is a volume rocker, in the same spot as the T-bolt, while the headphone jack sits on the top left and the power / unlock button on the far right. This is a great location because it lies right where our index finger likes to rest naturally, but we became frustrated that this particular button was flush with the rest of the phone, making it a little more troublesome to press. Continuing to the left side, all we see here is the micro-USB charging port amidst the chrome lining; nothing rests at the bottom besides the mic and the notch that opens the battery cover. Now we flip the Revolution to its backside, where racing down the middle is a strip of glass that not only houses logos, the 5 megapixel shooter, and LED flash, but doubles as a handy mirror. We found it difficult to scratch up the camera lens because it's recessed from the flat surface of the back; this design choice is wholeheartedly welcomed since it's usually so easy to scuff up your phone's camera when made flush (or worse, protruded) with the rest of the surface. 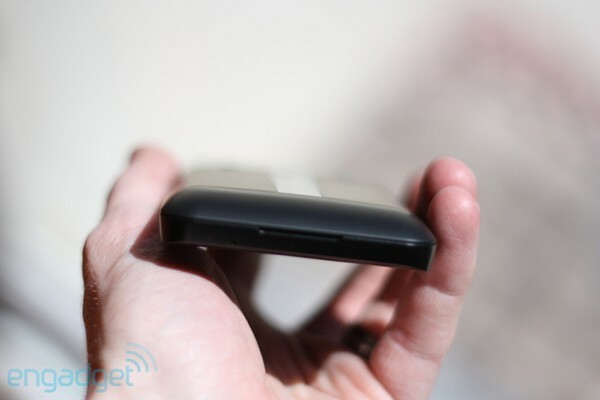 Also present is a thin speaker grill that actually reminds us of one found on the top and bottom of the HTC Desire HD / Inspire 4G. Curiously, upon removing the battery cover we discovered only half of the grill is used for the speaker; the entire left portion is completely for decoration. Keeping the battery cover off for a moment, we find an average-sized 1500mAh battery (we'll cover this in-depth later) keeping a SIM card and 16GB microSD company. The extra storage here, combined with another 16GB of internal space, will offer more than enough room for the average music or movie lover, though the microSD can be expanded up to 32GB if you have a hankering for more media. Finally, the front of the phone is where we'll find the mammoth display with speaker grill on top snuggling up to a 1.3 megapixel front-facing, self-portrait machine. Sure, video chat is all the rage these days, but there's something to be said about taking your own pictures for your Facebook profile without having to get in front of a mirror to do it (or without having friends, for that matter). There are no physical buttons on the front, because the usual four Android navigation keys below the screen are touch-capacitive. One interesting design feature to note is the inclusion of a lip at the very bottom, which angles down until it meets the back to make it look like a slight chin. We're not sure if there's any purpose to the lip, but it keeps the bottom of the Revolution from getting squared off. The entire front of the device reminds us of the Optimus Black; one seamless piece of glass covers the entire display -- including the navigation buttons -- with only a millimeter or two open at the top to leave room for the speaker. The 4.3-inch, 800 x 480 resolution touchscreen display fits right in with the rest of the LTE crew, without much deviating from the main course. LG opted to throw in a standard TFT WVGA screen that still looks very sharp compared to lower resolutions, but isn't the top of the line. We sat the Revolution next to the Droid Charge and can't hold a candle to the contrast on the Samsung Super AMOLED Plus display. The Charge's colors were much deeper and more vibrant, and was easier to read in direct sunlight, whereas the LG was barely discernable. The TFT display turned out to be brighter than the Super AMOLED Plus, but at the cost of washed-out colors. In side-by-side comparisons, the Charge ultimately wins the battle with its gorgeous screen, but we still enjoyed the brightness of the Revolution. The Revolution comes with Android 2.2.2 installed, which was expected but still made us shake our heads in disbelief. Here we're looking at the latest 4G phone on Verizon's network, but accompanying that excellent piece of hardware is an outdated OS. We think seven months is plenty of time to get all the necessary pieces put together and make Gingerbread a reality. 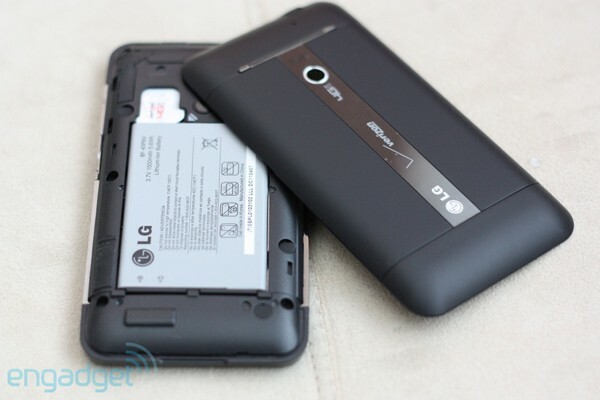 Running through this particular device gives us flashbacks to last month's review of the LG Optimus Black, which sports a similar, if not identical, Android skin. We remained skeptical of the UI's effect on the Android experience; after all, the performance on the Black -- which uses a comparable TI processor and the same RAM -- was less than satisfactory, making even the most elementary tasks and animations seem as though the CPU was running out of breath constantly. Fortunately, we didn't experience the same concerns with the Revolution. The UI was incredibly smooth and we witnessed very little laggy or sluggish behavior in processor-heavy tasks this time around, which does give us pause to wonder what could make up such a large difference in performance. LG offers two virtual keyboard options by default, and we were given the choice between Swype and an in-house option that is, once again, modeled very closely to the Black. The latter keyboard was very responsive, seldom mistyping letters or guessing the wrong words. In fact, we enjoyed the autocorrect features built into the Revolution a lot. The only frustration we experienced was the lack of popular symbols on the main board, such as the comma and question mark; the period was the only specialty key not pushed back into the symbols / numbers section. Since this particular user interface isn't seen very often in the US, there are a few changes and adjustments worth noting. The largest difference is in the widgets menu; long-pressing the home screen will bring up a menu style that looks exactly like an app tray, complete with icons for each widget. On the bottom of the menu are tabs for the four usual categories (widgets, shortcuts, folders, and wallpapers) to allow for easy switching back and forth as you decide how to customize and organize your phone. The navigation drawer is also slighty tweaked at the top to offer five easy on/off toggles for vibration mode, WiFi, Bluetooth, mobile data, and airplane mode; just underneath, a handy music player widget appears when a song is playing or paused. In fact, LG did a great job at integrating its media player into the UI altogether; for instance, a similar widget was built into the lock screen as a slide-down tab, so you wouldn't need to take more than one step to pause or change tunes. As evidenced in this and other skins, a popular trend that offers more customization is now emerging which chops up the app tray into multiple categories, instead of one big section that lumps all of the apps together. While we're not kin to letting LG choose where the apps are placed, it's possible to add, delete, or rename these categories. So even though there isn't a default way to just get rid of all categories, you can at least delete them if you'd like; another option is to choose the list menu instead of grid, which disregards the categories altogether and automatically places every app in alphabetical order. LG also added the ability to uninstall unwanted or unused programs directly from the app tray, a welcome feature. It doesn't, however, get rid of the unnecessary (yet obligatory) bloatware that's littered all over the Revolution. Adding to the pile of bloatware are the usual Verizon VCAST & Co. apps, plus a huge laundry list of other random programs: Let's Golf 2, Blockbuster, Rock Band, TuneWiki, Rhapsody, Slacker, and Netflix. We've been excited about the inclusion of Netflix ever since we first laid eyes on the Revolution at CES this year, because it meant the service was close to widespread availability on Android. We tested the app by playing scenes from multiple movies and TV shows while connected to 4G, 3G, and different WiFi connections, and with each test we noticed that playback was choppy, the video feed taking a nanosecond pause to catch up every few seconds. Thinking it was an issue with our device, we performed a hard reset and still experienced the same concern. 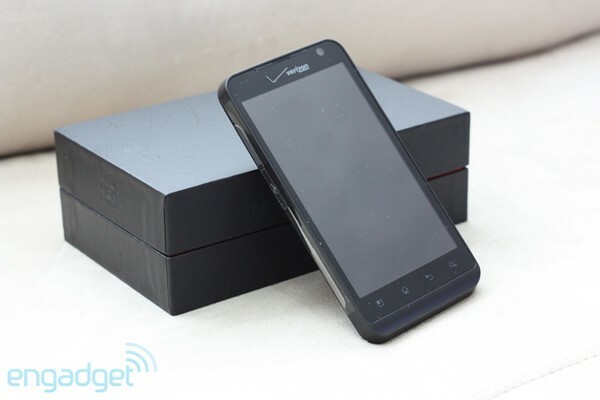 Of the Verizon LTE phones on the market, this is the first that received obvious love from Microsoft -- the Bing app and search widget were on the home screen when we first powered up the handset, and all web searches in the browser are done through Redmond's search engine. The search app can be removed from the home screen, but there is no Google widget to use as an alternative. Love or hate Bing Mobile, we aren't happy with being forced into a certain option. If carriers want to set up a default, go right ahead. All we ask is to be given the ability to change it if we so desire. There's at least one easy workaround to get your Google fix, though: head straight to the Android Market and find the official widget, or find a third-party browser that supports El Goog. If we were to go strictly by megapixel count, the Revolution shooter is the weakest of Verizon's LTE phone trilogy, sporting a fiver instead of eight. As we've learned, however, that number is often one of the most misleading, since sensors and optics play a large role in image quality. The images taken with this camera are highly detailed, although we did notice a contrast deficit at times; colors were slightly washed out in images taken in direct sunlight. Low-light pictures were mostly impressive, as long as we weren't trying to snap shots of the sunset -- in which case the background would go completely dark aside from the sun itself. There are manual settings aplenty here -- focus, ISO, flash, zoom, and white balance, among others -- and we enjoyed seeing a dedicated mode for macro focus even though the automatic setting typically did the trick. We were disappointed that it's missing a dedicated shutter button, but LG created a cool trick in hopes of meeting us in the middle: holding down the shutter key will keep the autofocus locked until you're ready to actually take the picture, much like you can with 2-stage buttons on a regular camera. As we have seen many similarities between the still camera on both phones, we were expecting to have the same thing happen to us when using the 720p HD video capture. Fortunately, it looks as though the camcorder on the Revolution has had some bugs worked out. Playing back the .3gp files on the computer did not change the aspect ratio as we had experienced on the Black. On the contrary, the videos cranked out a smooth and beautiful end result. And now it's time for the budding question everyone's begging to know about: as an LTE device, how does the battery hold up? When the Droid Charge came out, it looked like Samsung had figured out the magic solution to take care of all those crazy power drain issues associated with the new 4G technology. We figured the Revolution's 1500mAh battery would provide talk times somewhere in between its two siblings -- the Thunderbolt uses a 1400mAh battery, while the Charge carries a 1600mAh -- and it's true. Unfortunately, though, it's much closer to the former. We managed just five and a half hours on one charge which included about 100 minutes of voice calls and then kept the phone idle (albeit with 4G connection instead of WiFi) until the battery died. To offer perspective, that's the amount of time we should be able to chat on the phone straight through, full to empty. In another instance, we left the phone on to receive only emails and texts, and the charge almost lasted the entire day. Don't leave your house without a car charger or external battery pack if you want the phone to last the entire day under moderate or heavy use. Our LTE speedtests are still almost as blazing fast as they were when the Thunderbolt first came out, though we're not seeing as many of the occasional spikes of 20Mbps or more, possibly due to an increase in 4G subscribers. We were able to reach consistent speeds of 13Mbps down and 8Mbps up. There's a certain joy in taking advantage of a mobile hotspot, seeing our computers hit higher speeds via a phone than our own ISP. Some of our test results can be found below. 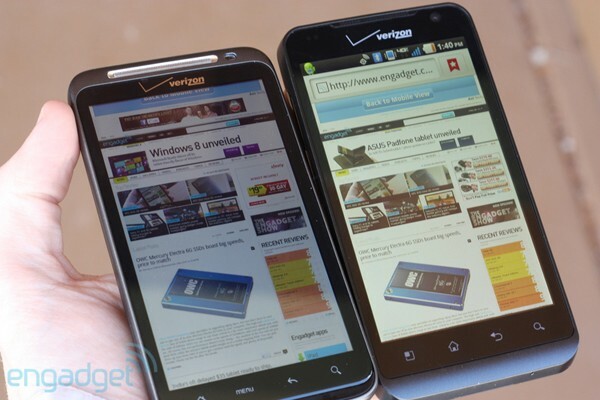 We did notice something curious with the Revolution when doing side-by-side tests with the other LTE phones. After conducting a couple dozen speed tests on all three LTE devices simultaneously, it was clear that the Revolution lagged behind the others on a consistent basis. 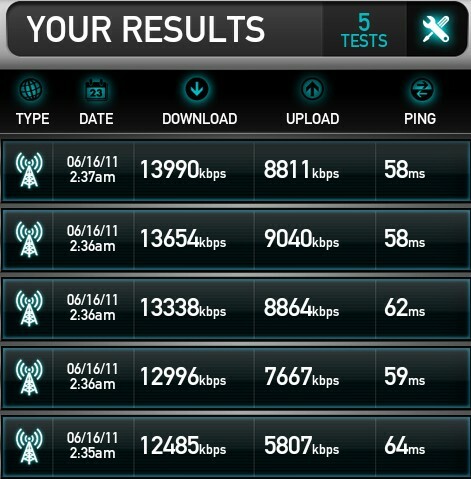 In some cases, the Droid Charge and Thunderbolt would exceed it by as much as 3-4Mbps. It's difficult to draw definite conclusions based on just one series of tests, but it did throw up a red flag. Finally, our calls came through loud and clear on the Revolution, with no difficulty hearing the other line and vice versa. We never experienced any dropped calls, even when chatting it up with friends in a basement and driving through a part of town that's infamous for losing reception. Zero complaints came from the other end of the call, and nobody had to ask us to repeat ourselves, though we usually do that without any prompting, anyway. With a name like Revolution, we immediately start visualizing a massive upheaval or shake up of the system, or perhaps a monumental transformation. 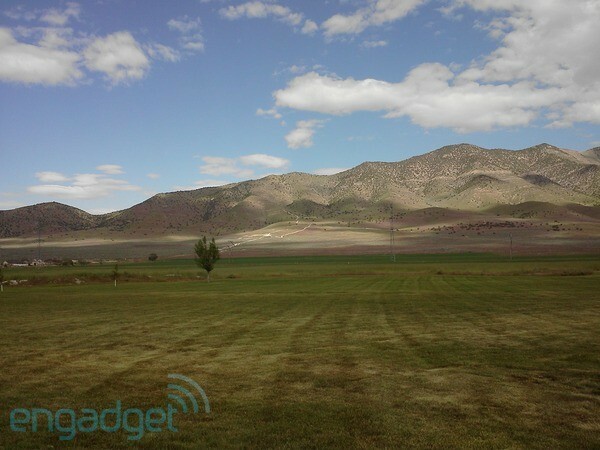 It's hard to pick out exactly where LG's first brush with LTE does either of those things. While it's a good smartphone overall, it doesn't offer anything new to Verizon's 4G lineup that we haven't already seen, and certainly didn't revolutionize the reputation the network has with battery life. Aside from an optimistic product name, the Revolution has midrange specs that perform decently and offers great call quality. If the LTE logo wasn't on the handset, however, it would be just another Android phone, getting lost in the ether amongst other top-choice smartphones like the Droid X2 and Droid Incredible 2. Perhaps it wasn't the most successful "revolution" in the strictest sense of the term, but the 4G uprising is just getting started.